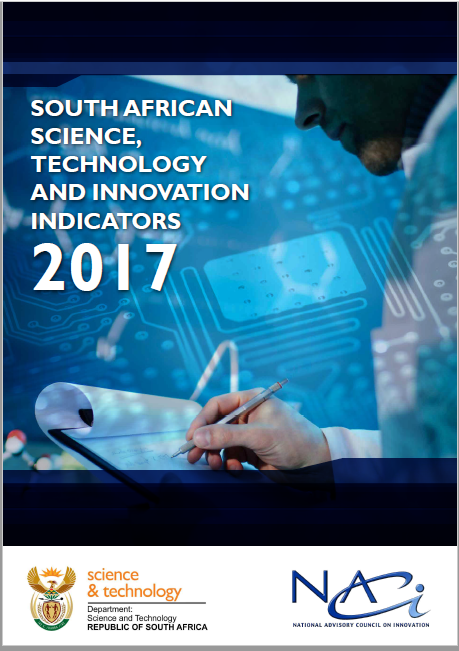 On behalf of the National Advisory Council on Innovation (NACI), I am delighted to present the 2017 report on South African Science, Technology and Innovation (STI) Indicators. The draft new White Paper on STI proposes that NACI provide hindsight, insight and foresight to help the National System of Innovation (NSI) to build scientific excellence and innovation capacity, with the ultimate aim of reducing poverty, unemployment and inequality. NACI and the DST-NRF Centre of Excellence in Scientometrics and STI Policy begun work on developing a monitoring and evaluation framework and system for the NSI, which will involve engagement with all key actors. The STI Indicators Report is part of our current contribution to building the monitoring, evaluation and learning capability necessary for assessing the state of the NSI.It draws from the recently finalised Innovation Scorecard Framework, which was developed following broad consultation. This publication introduces new elements, covering, for instance, provincial and local innovation systems. The STI Indicators Report identifies some challenges, as well as areas in which progress has been made. In 2017, South Africa ranked 39 out of 127 countries in business and innovation sophistication, a sub-index of the Global Competitiveness Index. Research and development investment, as a percentage of gross domestic product, increased to 0.8 in 2015/16, slightly up from the 0.77% recorded in 2014/15. However, this is still far from the target of 1.5% in 2019. The venture capital industry plays a significant role in catalysing and growing technological entrepreneurship, especially for new high-growth start-ups. According to the 2017 survey of the Southern African Venture Capital and Private Equity Association, captive government funds, at 39%, were proportionally the largest source of funding for all the active deals invested, followed by independent funds at 35%. The NSI human capital pipeline remains constrained. NACI continually monitors and comments on the percentage of Grade 12 learners who obtain 50% or more in Mathematics and Physical Science. For Mathematics, this percentage has been fluctuating for over a decade, from 18.1% in 2008 to 11.8% in 2015. There is good progress in the number of women university graduates in science, engineering and technology (SET) disciplines. However, the proportion of women is below par at doctoral level (43% in 2015). In 2015, most of these degrees were in health and related clinical sciences (58%), life sciences (58%), education (52%) and agricultural sciences (50%). The number of women obtaining doctoral qualifications in disciplines like engineering, mathematics, statistics, and computer and information science is still low. The transformation challenge remains, and all NSI actors need to consider what they can do to address it. The NACI Council and Secretariat are confident that all NSI stakeholders, including policy makers, the private sector and non-governmental organisations, will find this STI Indicators Report informative. We hope that it will also serve as a source of recognition of the work done so far, and an inspiration for further efforts to build the NSI.